March 2018 - American General Construction Inc. The new construction era in the millennial age is booming because of the use of the Fabric Building. The Fabric Building is the number one corrosion prevention plan in buildings today. They have up to if not to exceed 30-year warranties and are cost efficient in the building process as well as maintenance post construction. The steel is permanently protected from corrosive elements both inside and outside the structure. The fabric liner keeps all the steel elements out of contact with the frame, hence, preventing corrosion from starting. 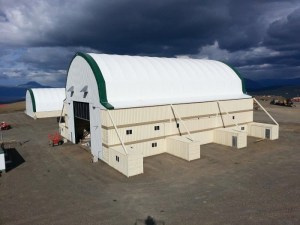 The Fabric building is particularly popular for bulk storage uses such as; mining, marine locations, military, aviation, salt, and sand. For decades, Fabric Buildings have been utilized by Indian Casinos, Event Centers, Sports, and Churches as their start-up facilities based on the speed of construction and lower costs. Many, later replace their fabric structures with conventional construction once funding allows. But many also choose to keep their fabric buildings as their permanent structure. When we say, ‘Fabric’, we are talking about a layer of architectural fabric. AGC’s fabric membranes are made from IPG’s NovaShield. IPG’s patented weave produces impressive strength-to-weight ratios and its lighter weight makes for easier, faster, money-saving installations. NovaShield features excellent physical properties, wider widths and better color retention than comparable products. That ‘Fabric’ then attaches to the building frame, inside and out, covering every steel part in the frame, including the fasteners and welded areas that the epoxy may have missed. 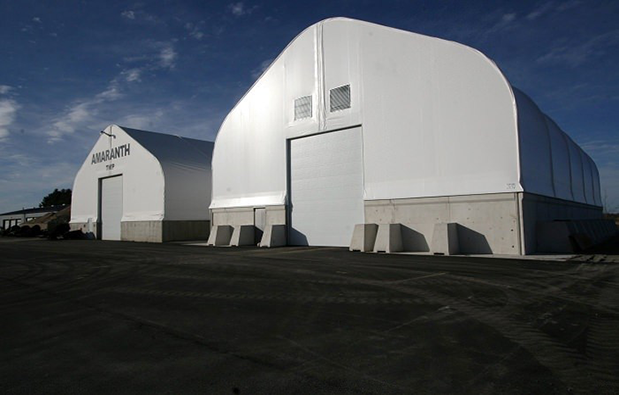 The Fabric Building liner provides an incessant barrier that, unlike traditional steel coating approaches, will not chip, pit, or crack over time. Using fabric liners is the only solution to eliminate dust and even birds from settling on the frame. When you use the Fabric Building you are choosing a cost-effective alternative to epoxy paints. As an industry leader, AGC has constructed thousands of buildings and self-performs the installation of your Britespan Fabric Building and can handle your entire project, Turn-Key, from start to finish.